Cleaning paint brushes is a hassle and a new brush gives a better finish with cleaner cutting in and no stray fibres. 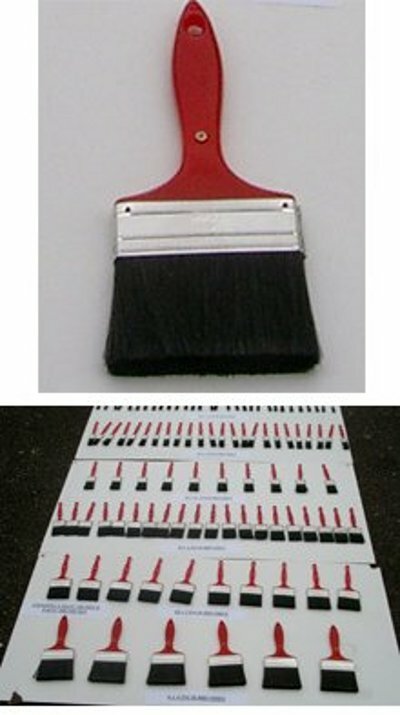 This set of 100 paint brushes brings the cost per brush down so that they become disposable. You get all the paint brushes you are likely to need for a job from 4 inch wall brushes down to half inch brushes for painting, window frames, stencils and cutting in. The nylon bristles are ideal for water based, oil based, vinyl and eggshell paints. There are enough brushes to have a brush for each paint type and colour. Professionals will appreciate that expensive speciality angled brushes such as sash brushes and trim brushes are no longer required, you simply cut these brushes across the end of the bristles. 100 Paint Brushes text, images and video are copyright.